It is beleived to be the Rottweiler has been developed from the Roman cattle dogs. The Roman empire made a camp in a place at Germany in 74 AD. The area was called as 'das Rote Wil' and later as 'Rottweil'. In the middle ages Rottweiler was used in bear hunting and as a cattle dog. In 1899 the International club for Leonbergers and Rottweiler dogs was formed in Germany. In 19th century due to set in of railways the cattle was moved by railways and the need for the breed declined. When the world war was set in there came a heavy demand for police dogs. 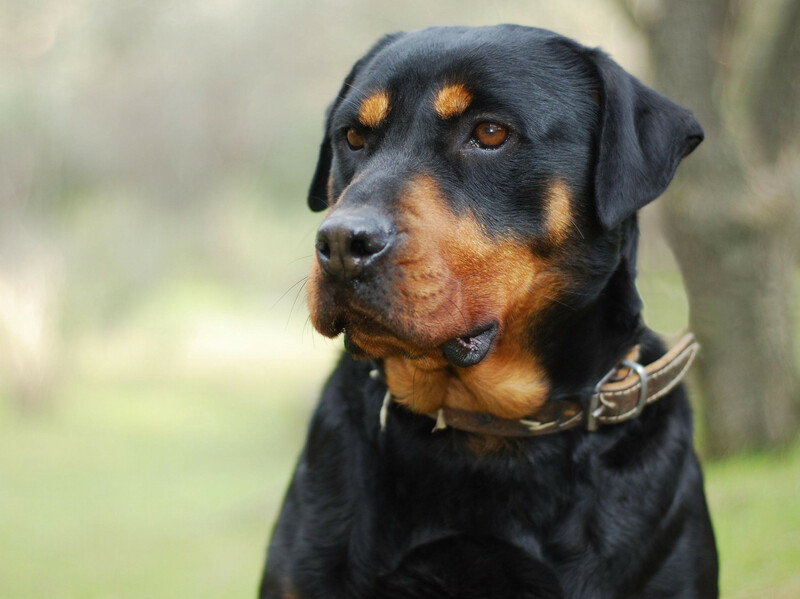 Rottweilers played a major role in first and second world war. In 1921 many German Rottweiler clubs joined together to form ADRK, which is Allgemeiner Deutscher Rottweiler Klub. This is said to be the home club of Rottweiler. American kennel club recognised them in 1931. They become 9th most popular breed in America in 2013. 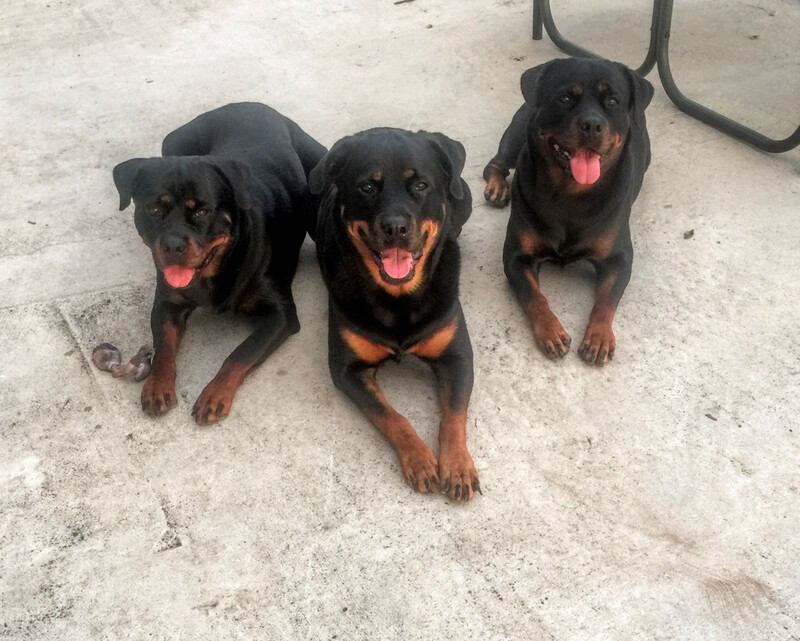 Rottweilers are good natured, obedient and are very much eager to work. They are calm, confident and an excellent watchdog. They will not make friends immediately. Rottweilers can be said as an all purpose dog since they are suitable as companion and watch dog as well. He is good in herding and guarding as genital feature. 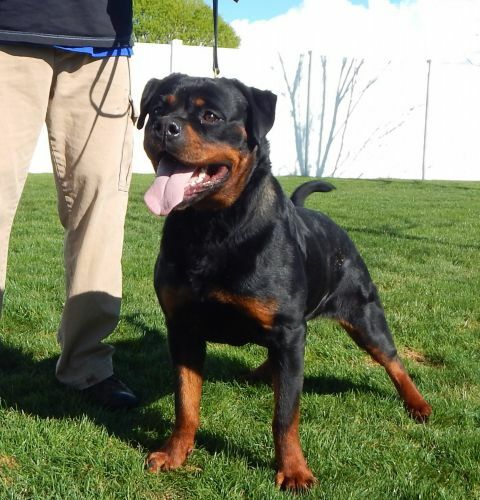 Rottweiler must be trained from its younger stage and should not be hit while training. They have high energy level and thus they are interested in doing work if properly trained. There are more possibilities of biting the strangers because of watchdog tendency. They are very good in herding sheeps as they have a natural gathering style. They are clever and adjusts the barking sound according to the situation. While herding they used to prove the leadership by selecting the dominant one in the flock and challenging it. If they were made to watch a same flock of cattle regularly, then they will develop a bond with them and will be affectionate with them as long as the cattle obeys its commands. The health issues affecting the eyes of them are Cataract and Progressive Retinal Atropy. Health problems common in their joints are Hip Dysplasia, Elbow Dysplasia and Panosteitis. They also have chances to get circulatory system problems like Aortic Stenosis and Von Willebrand's Disease. Other common health problems in Rottweiler are Bloat and Cancer. Mostly people think that Rottweilers don't shed but they are short haired dog and sheds more. They are having double coat that is undercoat and topcoat. The undercoat is softer and protects them in winter and topcoat is rougher and visible. It is said that they will shed in spring and winter seasons. Shedding can be reduced by brushing them. 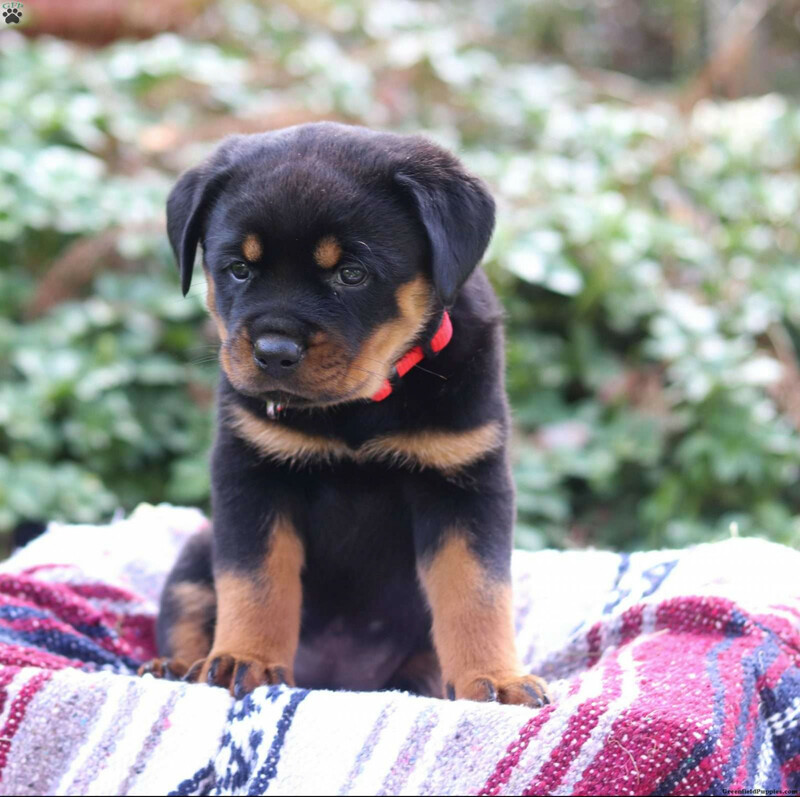 Rottweiler puppies should be given a diet which has protein, carbohydrates and fats. They need different diets in their growing stages. They can be given chicken with bones and vegetables for 4 days in a week. Beef with vegetables can also be given. When feeding them red meat a raw meaty bone can also be included. Fish oil can be given such that starting with 1000 mg and making it to 3000 mg in a time of two weeks. High calories of protein should be provided to them to meet their energy requirements. While buying commercial food it should be checked for the main ingredient to be meat. Protein levels should be more from animals than vegetables. High quality dairy products should be included. Food should not have low quality flavours and preservatives. Healthy fat is necessary for their skin and coat. If these fats are not provided it will cause dandruff and itchy skin. Brushing them weekly once is recommended for their coat and skin. Buying the puppy from reputable breeder will be better. Vaccinations and preventive medicines should be given on right time. Spaying and Neutering should be done to avoid unwanted pregnancy. High quality diet should be maintained. Making them to bath once in a week is advisable. Nails should be trimmed once in every two weeks. Rottweilers like to chase something and Laser pointer will be a good game for them. It will make them busy and also entertain us. But it should be on a limit and they should not get bored. A treat or toy can be hided and they can be made to find it. A bottle should be filled with water and frozen. The frozen bottle can be given to them for playing. In summer time it will make them very happy to play with it. A ball or toy can be thrown and they can be made to fetch it. Walking them is also a good exercise. They are friendly with children and enjoy the company with them. But it is not advised to leave them with children without adult supervision. 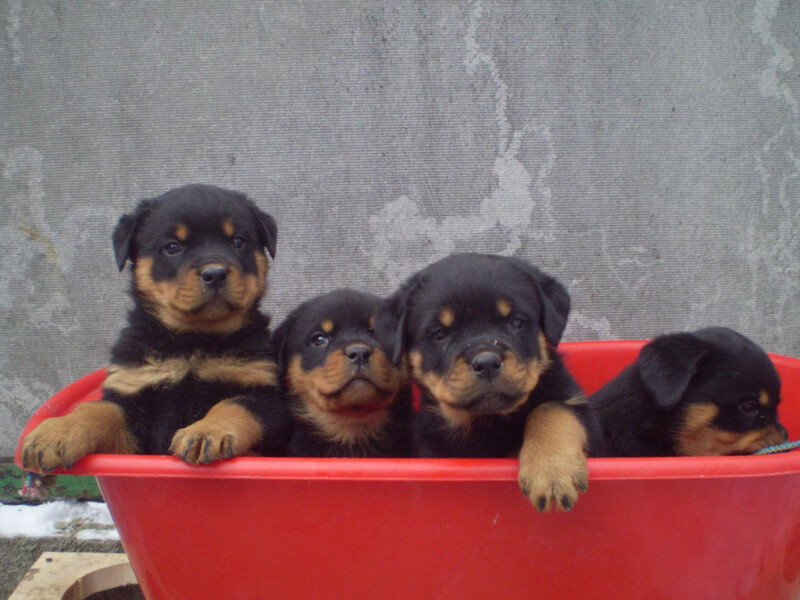 Rottweilers do not make friends immediately but take time to know about new people. He is an excellent watchdog. Males are quiet in nature but are watchful and females are more affectionate and obey some more. A good training is required for them to obey your orders. They are not good for apartment life and thus a fenced back yard will be better for them to play and spend the energy. They require companion and will be happy to walk around with you. Hot weather will be some what better for them when compared with cold. Rottweilers are easy to train because of their high intelligence. The training should be started in their young stage to have best results. They should not be dominated but treated kindly with understanding. They should be comfortable with the surroundings and people. Giving him a reward for training will make him interested in doing it. If he does a mistake then he should not be hit, so that he may get fear and loss his interest in doing it. Punishments will never work for them but rewarding will make him encouraged. Simple commands such as sit and stand shall be taught to them.